Pantone's Colors of the Year ~ Roses and Rain Boots . Are you ready?! 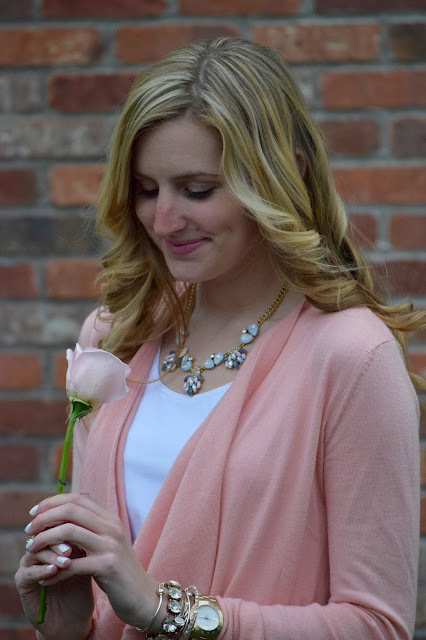 The Style Collective Spring Style Challenge is FINALLY here. The girls and I have been talking about this challenge for a couple of months now and of course after we finalized the themes the weather turned crazy! Between the wind, rain or snow it has been impossible to take photos. Eventually I was able to brave the cold and snap a couple quick shots of today's outfit of the day featuring Pantone's Colors of the Year: Rose Quartz and Serenity. I have a confession to make this necklace is actually my mom's! She has a great sense of style, which is why I often look to her for the finishing touches when something is missing from a look. This past weekend I was trying different combinations because I absolutely LOVE these pants I scored from J.Crew factory last year and knew I wanted to incorporate them into Monday's style challenge; however, something was missing. When I told my mom the theme she disappeared for a minute and returned with this necklace. And of course it was perfect! 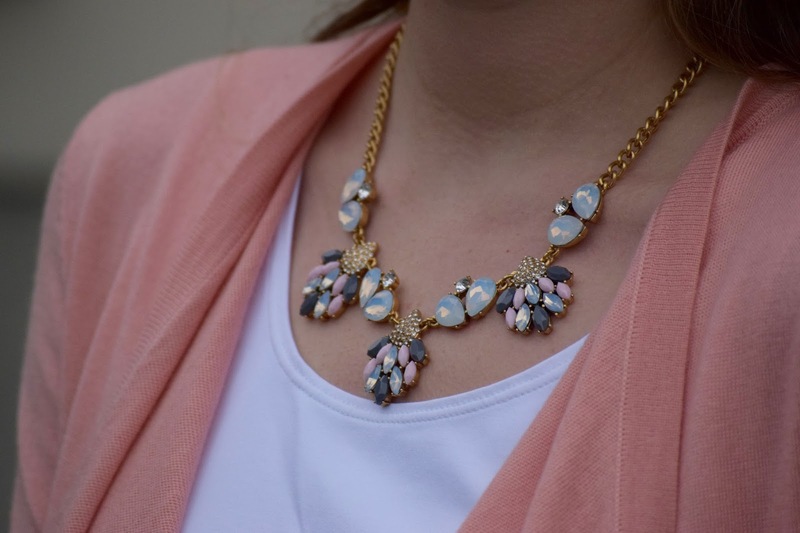 I love the way this necklace incorporates both of Pantone's colors into one beautiful piece. I love a good #armparty. I usually put a lot of thought into the various bangles I select because I really like to create a cohesive (matching) look. A typical arm party starts with my Cape Cod bracelets, Pandora bangle and Marc Jacobs watch. Then I add various colorful Alex and Ani's and one or two other statement pieces to complete the look. I am not a sneakers person. I cannot rock them nor would I wear jeans and a pair or Nike's ever. However; Converse and Keds are definitely my jam. I know these are technically sneakers but they are more of an tennis shoe, since they aren't really made for anything athletic except running errands or going for a quick walk. Anyway, as soon as I saw these Keds last year on my girl, T. Swift who was rocking tennis sneakers with dresses and skirts I had to have them. I mean how cute are they?! They have little floral eyelets on them too. The funny thing is I definitely feel like a little kid in them and when I was younger my mom couldn't pay me to wear Keds. Your printed pants are so cute! I love how you incorporated the colors. Great outfit! Cute outfit! Love the print on your pants!! I'm loving the pantone colors paired with your necklace! Love how you incorporated the serenity color! Also how is your mom so cool? LOL. Happy Birthday to your mom! You look absolutely darling here! Love that necklace! You absolutely nailed the pantone look! Such a great combo with the rose colored jacket and the fun printed pants! You look so beautiful in these colors! LOVE your style! 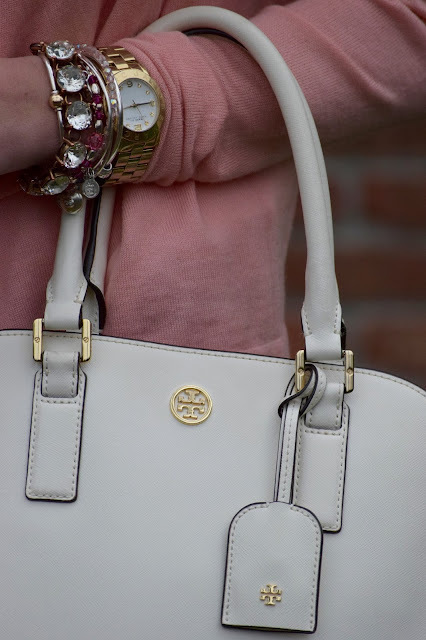 I love your arm party, it's perfection! 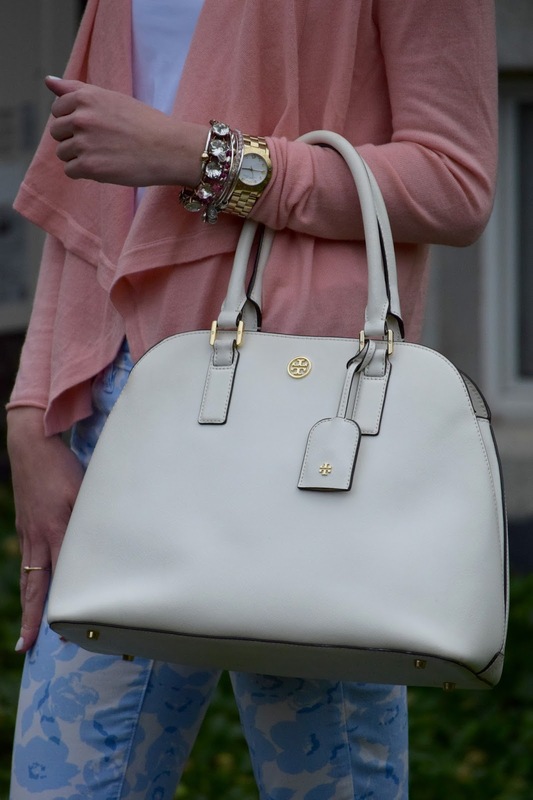 Your necklace, bag, and arm party complete the look PERFECTLY!! Great post!